The Rolling Stones have surprised fans by performing the entire Sticky Fingers album at Fonda Theater in Los Angeles ahead of their stadium tour. The show at the Fonda Theatre marked next month’s reissue of the 1971 classic album. The Rolling Stones are re-releasing Sticky Fingers album along with previously unreleased material and alternative re-workings of beloved album tracks. Sticky Fingers captured The Rolling Stones at the peak of their powers and features timeless tracks such as Brown Sugar, Wild Horses, Sister Morphine and Dead Flowers, and will be reissued in a variety of formats on June 8/9. The audience on May 20 included Jack Nicholson, Bruce Willis, Harry Styles, Leonard Cohen and Patricia Arquette. The concert at the 1,300-capacity venue sold out instantly. Mick Jagger told the audience: “So this is our first show of our tour. The band played for an hour and a half, and used its encore to pay tribute to the blues guitar legend BB King, who died last week. 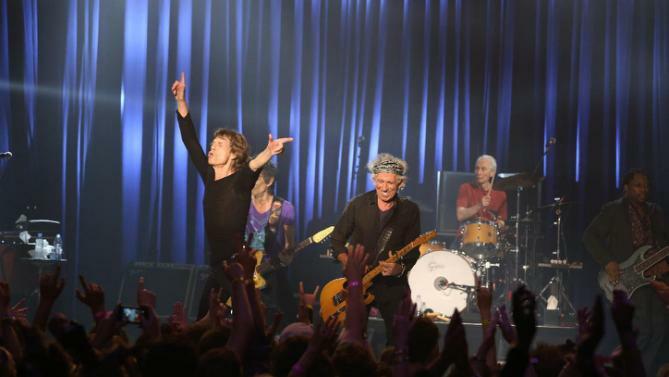 The Rolling Stones kick off their North American Zip Code tour in San Diego on May 24.